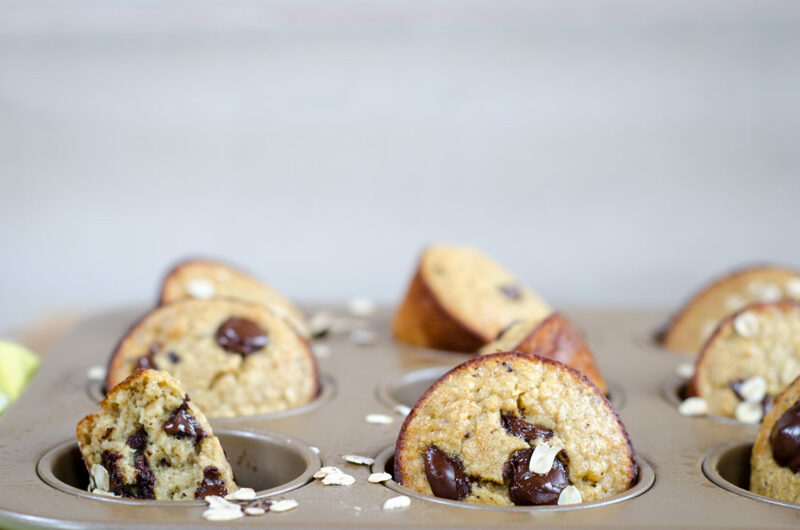 These muffins are mostly sweetened with a dark banana, along with some raw honey, but if your banana is super sweet, you can certainly use less honey. For the Greek yogurt, my favorites lately are the Greek yogurts that use stevia (a natural super-sweet herb) to sweeten, as opposed to added sugar. You could also just use plain Greek yogurt instead of vanilla. I hope you enjoy these! I would love to see you on Instagram, Facebook and Pinterest. Happy baking! 1. Oven to 400 degrees F.
2. In a food processor, blend together the first 5 ingredients until smooth. Add the next three ingredients, and processing until smooth. Add dark chocolate, and pulse 3 times. 3. Evenly fill 12 muffin tins sprayed with nonstick cooking spray. (I like mine brimming to the top, so I made this recipe so that each muffin would be completely full). 4. Bake for 15 – 17 minutes, until done. They don’t rise a ton, but they are delicious! Let cool slightly, then enjoy! This looks wonderful! Im making these in the am! My people will love these! Thank you!